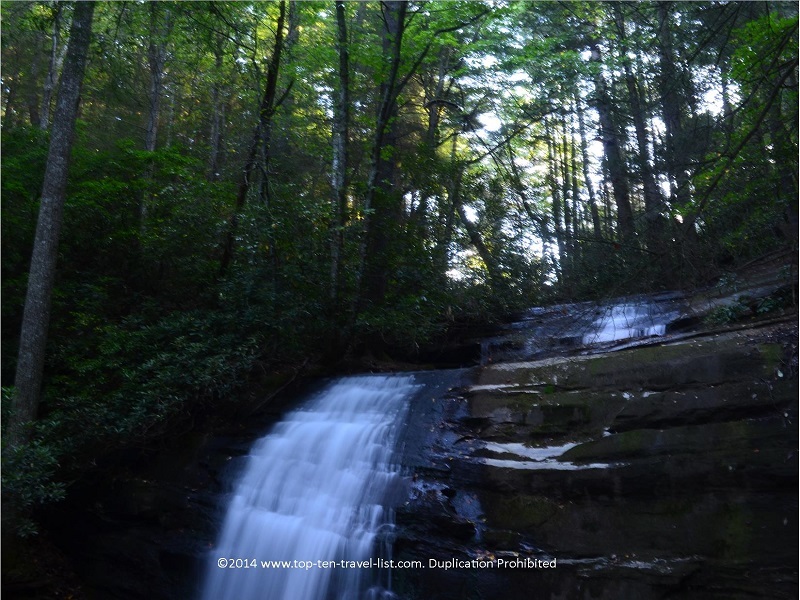 Hiking the Appalachian Trail: Beautiful Long Creek Falls in Blue Ridge, Georgia - Top Ten Travel Blog | Our experiences traveling throughout the US. Beautiful Blue Ridge, Georgia is located near the southern end of the Appalachian Trail, which officially begins at Springer Mountain in the Chattahoochee National Forest. At 2180 miles long, the trail is one of the longest in the world. The popular trail stretches all the way from Springer Mountain in Georgia to Katahdin, Maine. Many adventurous hikers over the years have attempted to complete the entire trail. Those who survived the long trek (typically 6 months or more) have truly accomplished an enormous feat. According to The Appalachian Trail Conservancy, 1 out of every 4 “thru hikers” complete the entire journey in a continuous pattern. The hikers that complete this enormous undertaking are known as “2000-milers.” Sounds crazy?! Even if you never have the grand opportunity to walk the entire length of the trail, you can easily pick and choose amongst the thousands of miles of trails available. 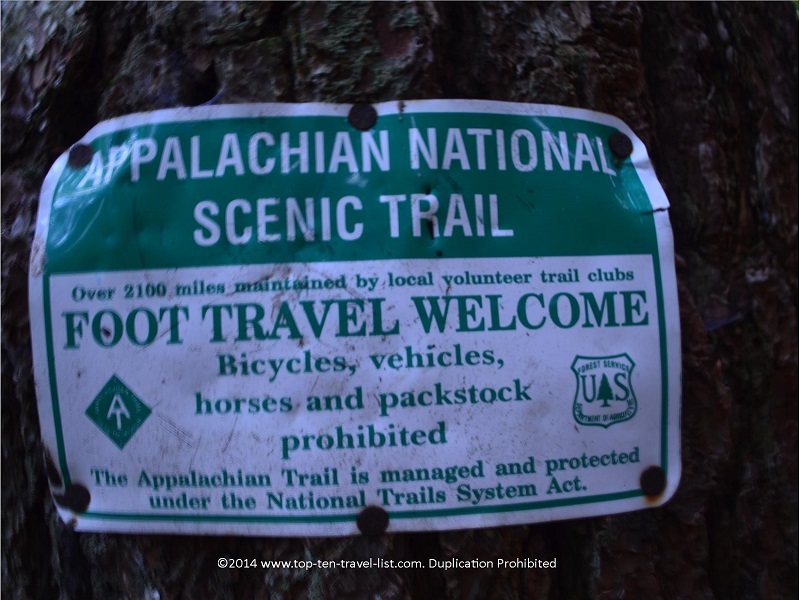 Because the trail is located within 14 different Eastern states, the opportunity of living or vacationing near the start of at least one trail are numerous. Across the length of the trail, opportunities for wildlife sightings are common. You may see black bears, moose, white tailed deer, other small mammals, and plenty of interesting birds. Bears are more common in the Smoky Mountain sections, while moose are more common in Upper New England. 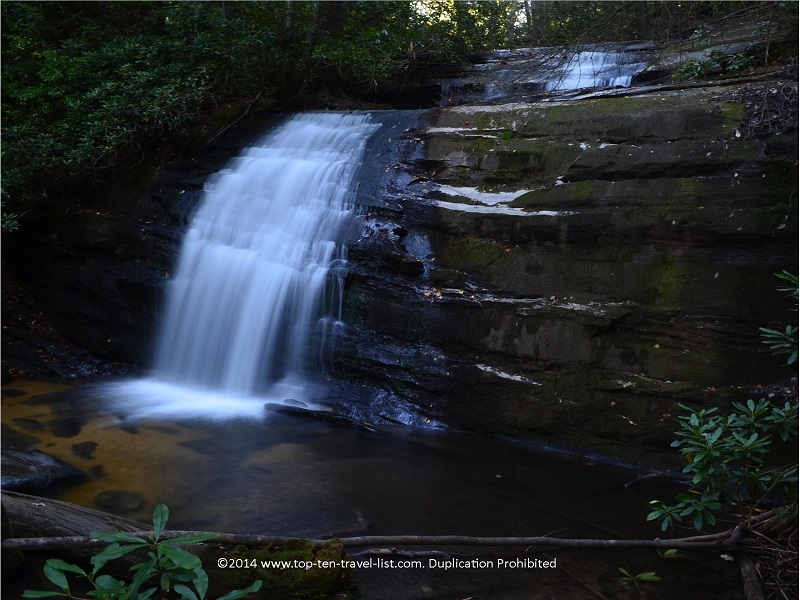 One popular trail for beginners is the hike to Long Creek Falls, located in the Chattahoochee National Forest in Northern Georgia. This trail is short, approximately 2 miles round trip, however, the climb is a bit steep giving you a great workout. 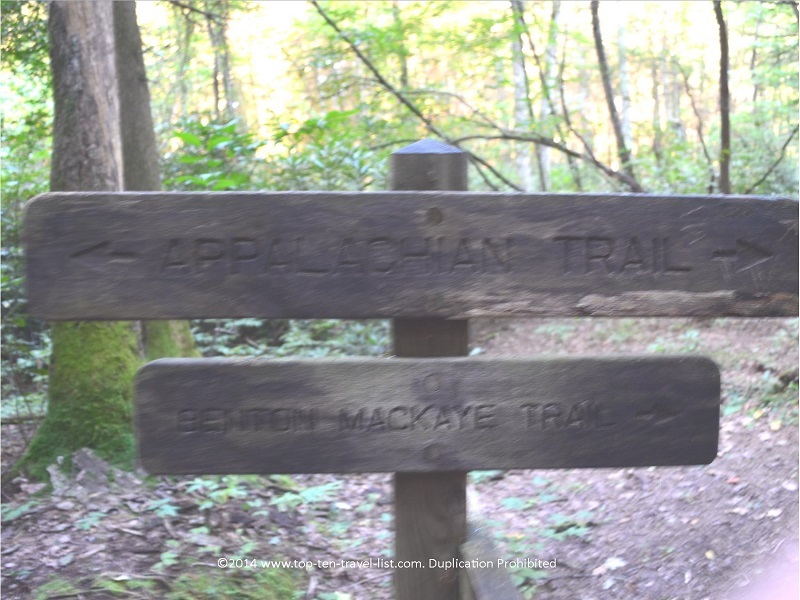 It is accessible from 3 different longer trails: The Appalachian Trail, The Benton McKaye, and the Duncan Ridge Trail. The Appalachian and Benton McKaye trail combine on this section of the Appalachian. Day hikers can park on the road and take the quick 2 mile journey just to see the waterfall. However, if you feel like continuing on, the opportunities are endless. Mike and I decided we wanted to check out this trail because the waterfall was supposed to be particularly beautiful during the late summer and early fall season. After a moderate 1 mile uphill walk, you will come across this magnificent waterfall (about 50 feet tall). The greenery surrounding the falls creates a perfect setting, which I imagine would be even more spectacular during the fall season. Early morning is the best time to visit as the crowds will be fewer and the temperatures will be beautiful (upper 50s/lower 60 during our late September visit). The hike itself is very scenic with pretty views of the woods and steam along the way. 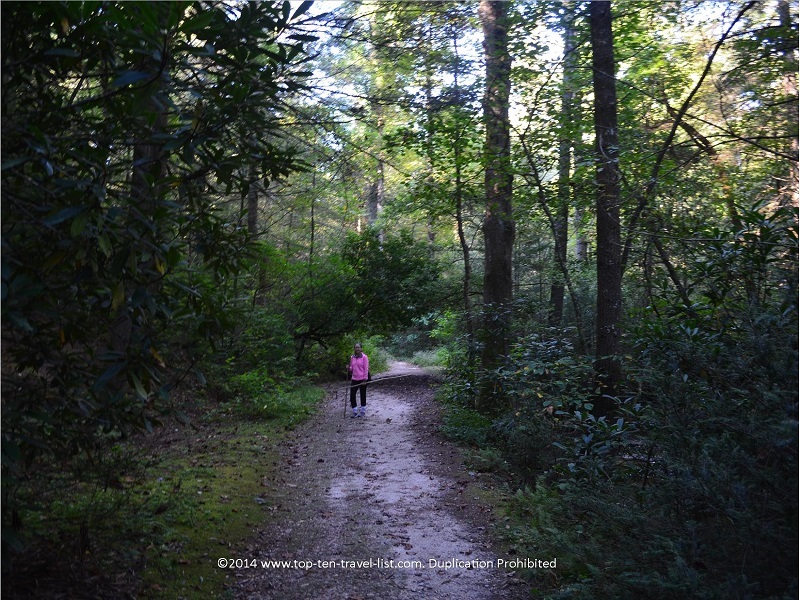 If you visit on a weekday morning like we did, you will not see many other people on the trail. In fact, we were able to snap a few nice photos of the waterfall with no one else around. However, if you plan your visit on the weekend, expect the trail to be much more crowded. Long Creek Falls is a popular day hiking destination for both tourists and Georgia locals. 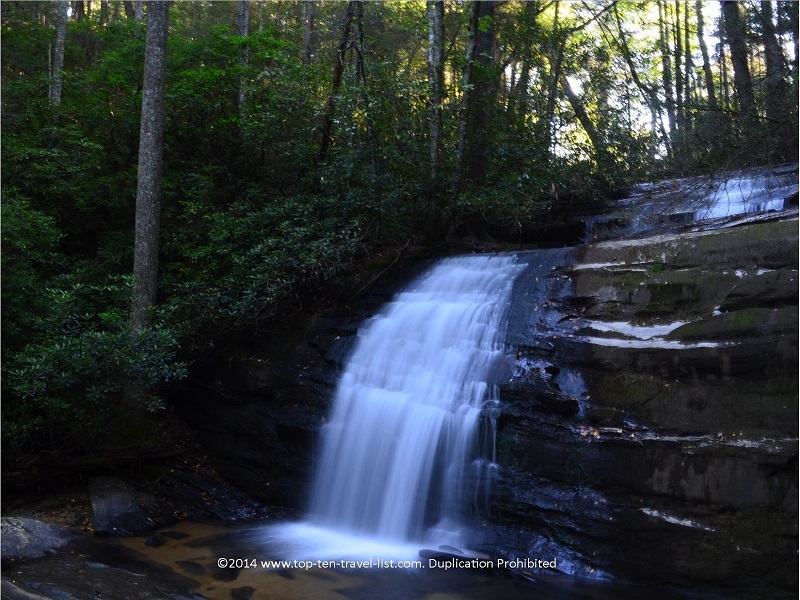 Long Creek Falls is a great addition to your Blue Ridge/Northern Georgia vacation. It’s easy enough for the whole family to complete and will not take up too much time, nor tire you out for the rest of your trip. It took us about 45 minutes round-trip, including stopping to take multiple pictures of the falls. However, we were rushing a bit due to time constraints, so I recommend giving yourself at least an hour to leisurely walk the trail and take as many pictures as you like. Although there are many wonderful activities in the Northern Georgia region, your trip isn’t complete until you block out a bit of time to explore the beautiful mountains and forests which comprise the area. And what better way to do that than a fresh, scenic, invigorating hike to a beautiful waterfall on the famous Appalachian Trail? Directions: From Blue Ridge, go south on Aska Road 13.5 miles to end. Turn right onto Newport Road, go 4.5 miles to end. Turn left onto Doublehead Gap Road and continue on this road about .8 miles to intersection with dirt-gravel USFS Road 58 intersecting sharply from right. Turn onto FS 58 and continue into forest and uphill 5.3 miles to Three Forks. Noontootla Creek, a beautiful trout stream, is on the right as you ascend. 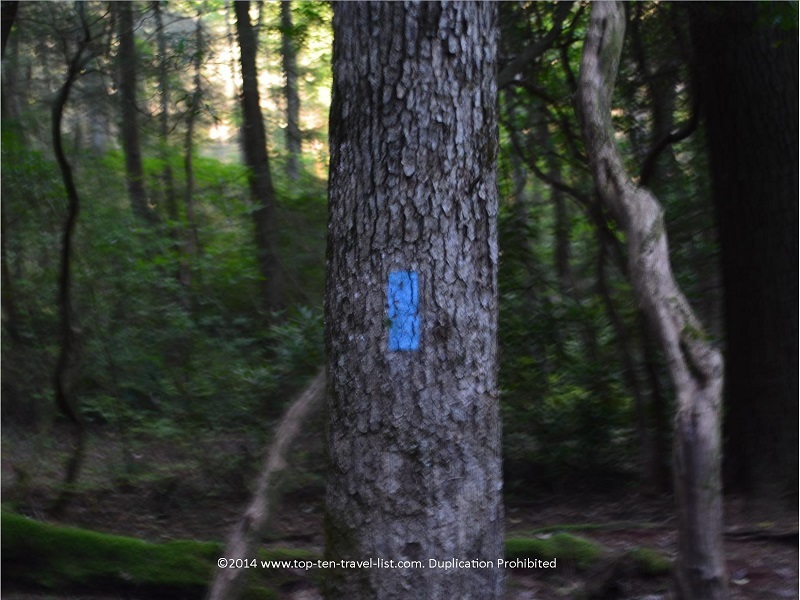 (Directions courtesy of BlueRidgeMountains.com). This hike can be a bit confusing to find if you are not from the area. 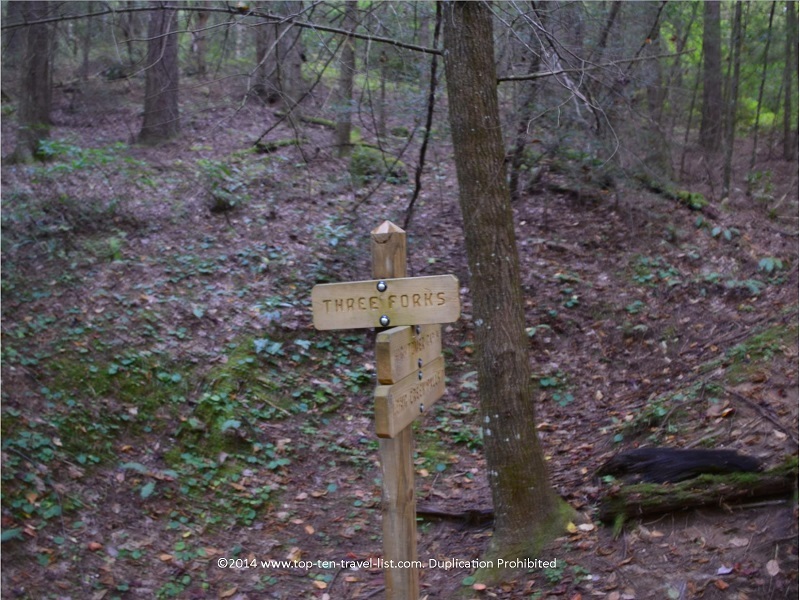 As you travel the slow 5.3 mile journey up the gravel road in the forest, be sure to watch out for the sole brown hiking sign (pictured above). Underneath, you will see the word falls written. When you come across this sign, you are in the right spot! Because we arrived so early in the morning there were not many other cars around, so we weren’t sure if it is was the right hike. Luckily, it ended up being the right trail. Just be on the lookout for the sign and most likely several cars parked along the road. 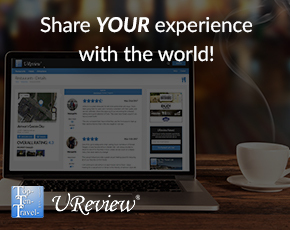 *Visit early in the morning, preferably on a weekday, for fewer crowds. *Bring with plenty of water. *Eat something before your hike. The drive combined with hiking time will easily add up to a few hours. I wouldn’t carry any food with you as it can attract a bear. *Be bear aware. Although no fatal attacks have occurred in Georgia, the risk is always present. 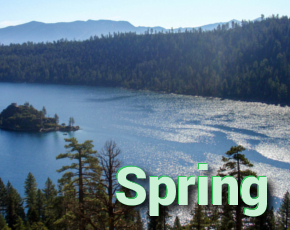 Wear bear bells, bring bear spray, and make plenty of noise on the trail. The bells will alert a possible bear of your presence so you do not suddenly surprise them. Also, bear spray can often make the difference between life and death in an attack situation. I also carry a hiking stick, both for extra balance and peace of mind. 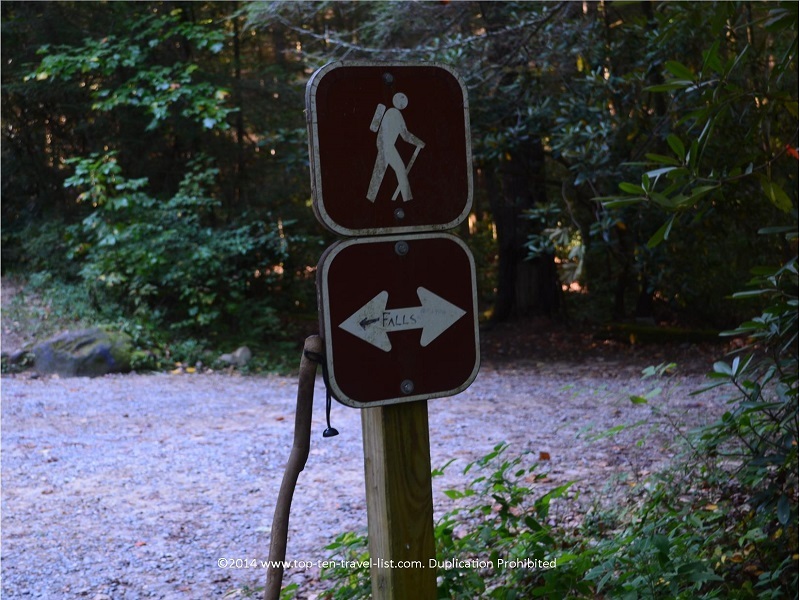 Check out more bear safety tips on The Appalachian Trail website. *Plan extra time for the drive to the starting point. Once you enter the forest, the drive takes much longer than you would expect a 5 mile drive to last. It took us about an hour and 15 minutes from our cabin rental in Blue Ridge. I estimate about an hour from the Blue Ridge downtown area. On the bright side, the beautiful views of the creek and trees along the way make the time fly by. *Bring with a quality camera and stand to photograph the magnificent waterfall. You will need a steady setting in order to get a great picture. It will also allow you to take group photos even if there are no other hikers present to take your picture for you. *Don’t overdress. Despite temperatures in the upper 50s, I had to remove my sweater halfway through the hike. You will work up quite a sweat on the uphill climb. Dressing in layers is always recommended. *Wear proper hiking shoes with good traction. I like Columbia’s multi purpose shoes. *Let others know where you will be just in case of an emergency.